Clutch, an independent Washington, DC research company identifies leading B2B professional services firms that deliver the best results for their clients. Clutch accumulates information, research data, and personal interviews to create data driven reviews. Working with over 7,000 agencies in over 500 categories they help industry professionals find the best possible resources. An independent research firm, Clutch, recently released their list of the highest rated IT services companies in Chicago. JetRails is proud to announce we were listed among the Top 5 Cloud Consultants in Chicago. We also placed among the Top 10 Managed Service Providers and IT Consultants with over 100 firms being considered. These awards join our growing list of accolades including our Magento Marketplace Partnership. Clutch’s proprietary methodology is based on market presence, past work experience, and verified client phone interviews. 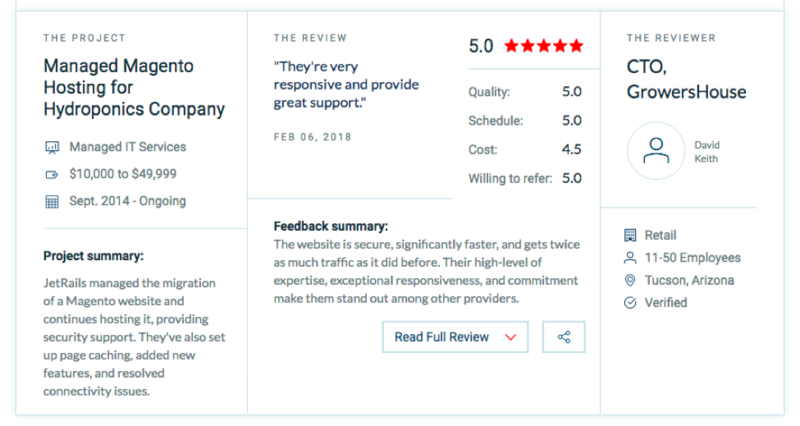 Companies looking for top-notch Magento hosting and consulting can now read our detailed client reviews in addition to our case studies.